In honor of Pierre Boulez’s 90th birthday next year, Taka Kigawa performs the composer-conductor’s complete works for piano, an instrument with which this modernist’s modernist had a life-long, if intermittent, relationship. 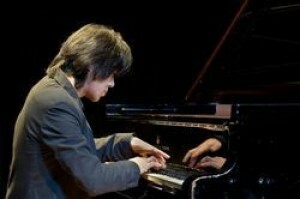 But Kigawa, who has already toured Elliott Carter’s complete piano oeuvre, has been getting rave reviews for his non-chronological approach to Boulez, whose first acknowledged composition was the seriously serial 12 Notations for piano (1946). The second and third of Boulez’s three piano sonatas are particularly badass. Moving beyond serialism, Boulez sought more elegant solutions to problems of control and freedom, adding flashes and fields of beauty throughout. Suffice to say that Kigawa brings both virtuosity and deep feeling to Boulez’s often convulsively gorgeous conundrums, radical restlessness, and temporal suspensions.